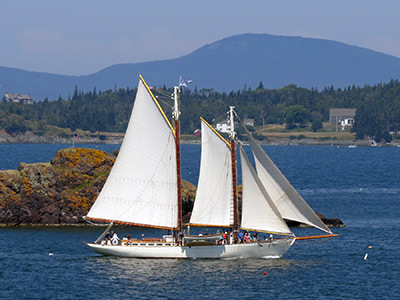 The Fox Island Thoroughfare is a gorgeous inshore passage approximately seven miles in length, which leads from the east to west side of Penobscot Bay, between North Haven and Vinalhaven islands. Today, this protected passageway is a favorite for Maine windjammers and pleasure craft alike to leisurely traverse or drop anchor in one of its coves for the night during the more seasonable months for sailing. In stark contrast, each year as autumn gives way to winter, such schooners and sailboats will have long since disappeared from the waters of the thoroughfare. Fun in the sun yields to frigid air and northeast gales; but as historical accounts reveal, the hardships did not stop there. During the winter season in the late 1800s and early 1990s, the Fox Island Thoroughfare also proved impassable as well. In fact, due to ice frequently closing the thoroughfare to navigation, the United States Lighthouse Service also decided to extinguish Browns Head Lighthouse during these periods. The lighthouse was established to help guide vessels into the thoroughfare from a westerly direction on Penobscot Bay. As for the keepers at Browns Head, one has to wonder how they passed the time during long winter days while the light was extinguished during the ice closures. 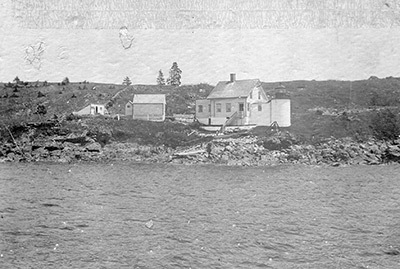 Not only was the light station far from the center of town in Vinalhaven, for weeks on end, the keeper could not even perform the primary task associated with his post as they patiently waited on word from the United States Lighthouse Service to “light up” once again when the thoroughfare was reopened to navigation. NOTICE TO MARINERS, Washington, February 19, 1873 – The Lighthouse Board gives notice that hereafter, when the passage through Fox Island Thoroughfare on the coast of Maine is obstructed by ice, a light will not be exhibited from the lighthouse on Browns Head, on the southernmost of Fox islands. NOTICE TO MARINERS, Lighthouse Inspector’s Office, February 2, 1881 – Information has been received at this office that Fox Island Thoroughfare was closed to navigation on the 27th (January), by reason of ice, and the light at Browns Head was not exhibited. When the Thoroughfare is navigable, the light will be again exhibited. 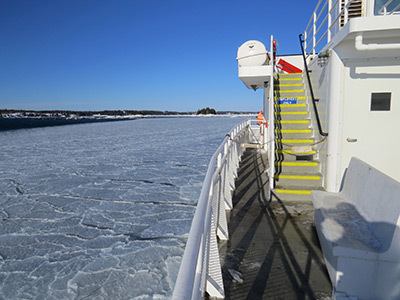 NOTICE TO MARINERS – Fox Island Thoroughfare was open to navigation 12th (March) and Browns Head Light was relighted same date. 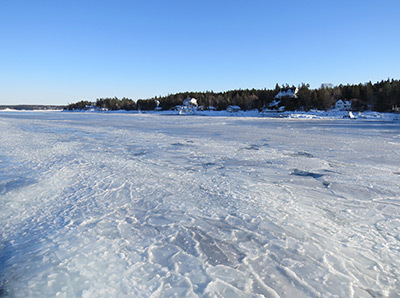 NOTICE TO MARINERS – Fox Island Thoroughfare, Maine: This thoroughfare being closed by ice, the light on Browns Head, at western entrance was discontinued on February 22. It will be relighted upon opening of navigation. NOTICE TO MARINERS, Portland, January 19 – Commander C.P. Rees, in charge of the first lighthouse district, gives notice under date of January 18 that, owing to Fox Island Thoroughfare being obstructed by ice, the light at Browns Head was discontinued January 15, and would be relighted when the obstruction is removed. 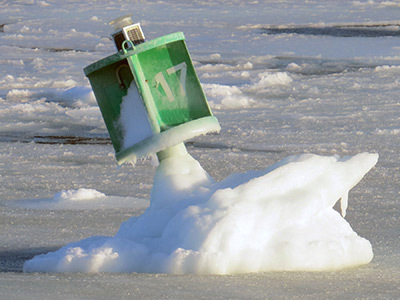 NOTICE TO MARINERS, Portland, Me., December 4 – The following bulletin has been issued by the local lighthouse inspector: When Eggemoggin Reach and Fox Island Thoroughfare are closed by ice, the lights at Pumpkin Island and Browns Head will be discontinued until the opening of navigation. 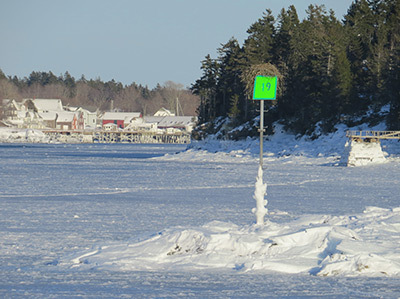 NOTICE TO MARINERS, Portland, January 28 – The light on Browns Head was discontinued January 24 in Fox Island Thoroughfare owing to the thoroughfare being closed by ice. It will be relighted upon opening of navigation. 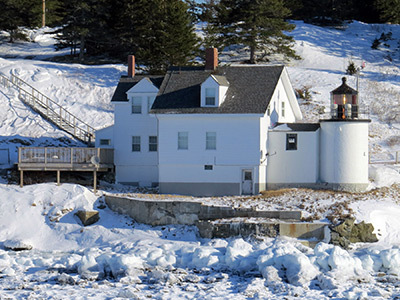 NOTICE TO MARINERS, Portland, Me., March 29 – Light at Browns Head Light Station, discontinued January 24, navigation being closed by ice, was relighted March 26, as the thoroughfare is again navigable. 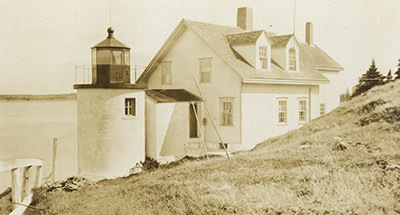 NOTICE TO MARINERS, Portland, Me., February 13 – Owing to Fox Island Thoroughfare being closed by ice, the light at Browns Head Light Station was discontinued February 9, and will be relighted upon opening of navigation. NOTICE TO MARINERS – The inspector of the Portland district gives notice that Browns Head Light at the westerly entrance to Fox Island Thoroughfare has been temporarily discontinued owing to the thoroughfare being closed by ice.